If you pay any attention to fashion, you’re probably familiar with Swatch watches. Originally founded as a Swiss consortium created to help the then-struggling timepiece industry, the Swatch Group now owns a number of companies and is one of the largest watch manufacturers in the world. In the early 1980s, they revolutionized the industry by introducing eye-catching designs that were combined with innovative manufacturing techniques to produce attractive timepieces that were surprisingly affordable. Their success spread throughout the country, helping to revitalize the Swiss watch industry as a whole. Today, the company offers more than two hundred different models for sale. Read on for the full Swatch watches review. Swatch watches were originally designed with the intention of being essentially disposable; they were not created to be long-lasting timepieces. Many of their models feature plastic cases, though their Irony line features models with stainless steel cases. Water resistance, not surprisingly, tends to fall to the low side as designer watches go, with most models offering a modest resistance to 30 meters. As the company’s products are also quite affordable, the lack of robust build quality is commensurate with their pricing. The watches have a two year warranty, so you’ll get a few years of use out of it, but don’t expect Swatch watches to offer the long life you’d expect from a Tissot or a Citizen model. It’s interesting that the brand was initially brought to the market to revitalize the mechanical watch industry in Switzerland, because today, most of the company’s products feature Swiss made quartz movements. They currently offer a few pieces that feature automatic (self-winding) mechanical movements, but some 95% of the company’s product line features quartz. The benefit of that is that they’re quite accurate, and surprisingly so, given the price range. Despite the relatively low price point, the company has been quite innovative over the years. The consortium that created the product line developed the Delirium, released in 1979 as the world’s (then) thinnest watch. They streamlined manufacturing to reduce the number of moving parts in their watches by nearly half, and they developed some unique ultrasonic welding techniques, which further sped up and simplified the construction process. Furthermore, their use of plastic and bright colors in their product line, as well as their targeted price point, established the company as innovators of affordable, eye catching casual design. Given the relatively low price point as designer timepieces go, you won’t be surprised to discover that their product line isn’t loaded with features. You’ll get the time, of course, and most of their models feature a second hand. Many include the date, and a few offer chronometer features. Aside from that, you’re not going to see atomic clock synchronization, atmospheric pressure displays or altimeters in the product line. That’s not to criticize them; models with those features are simply not on their list of Things To Do. Unlike most manufacturers of fine timepieces, they even offer a modest line of watches for children, making Swatch watches something that can be worn by the entire family. While these are relatively inexpensive timepieces, often made with plastic parts, you can expect to get a number of years of use from Swatch watches with proper care. Be careful to keep them away from extremes of heat and cold as well as caustic chemicals, which can damage the bands and cases. Batteries will likely need to be replaced every two years or so. Use a soft cloth to clean your watch. Aside from these issues, Swatch watches do not require any special care or maintenance. Treat them like the fine timepieces they are, and they’ll work well and look good for years to come. The brand is sold with a two year factory warranty against defects in materials and craftsmanship. While this is relatively short as designer watch warranties go, it’s reasonable, given the price point of their product line. Most defects will make themselves apparent relatively soon after purchase, so the relatively short warranty should not be of concern to most consumers. Extended warranties may be available for purchase from your retailer; be sure to inquire at the time of purchase if this is of interest to you. Despite bright uses of color and innovative design, prices are quite inexpensive as designer brands go. Most of their models fall into the $60-$200 range, though occasional limited edition models sell for somewhat more. 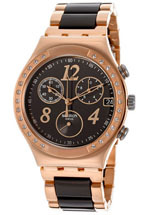 This is certainly on the low end of luxury watches, pricewise, and this makes these watches a bargain. You’ll get a nice looking timepiece at a price point that’s affordable for everyone. Many of their older models are sought out by collectors, and some of these have sold for several thousand dollars at auction and on the secondary market. We don’t suggest that you buy as an investment, but if you take care of your purchase, it may appreciate in value in the future. You can find the brand for sale at a large number of retail stores, including most mid to high end department stores and at some fine jewelry shops. You will also find them for sale at a number of online locations. As the company offers more than two hundred different models and some are limited editions, it may require a bit of shopping to find a particular model, as no retailer is likely to stock the entire product line. That said, as designer watches go, products from Swatch are relatively easy to find in the market. Despite a price point that is perhaps the lowest in the designer watch industry, Swatch watches offer a surprising variety of designs for both men and women. Their timepieces offer a diverse range of colors and styles, ranging from eye-catching unique designs for everyday casual wear to classic, tried and true designs that would look good in a boardroom. They even offer a line of children’s watches, for those so inclined. Swatch watches are widely available, mostly use highly accurate and low-maintenance quartz movements, and a range of pricing that makes them affordable for anyone. 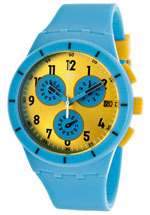 If you like eye catching designs that are easy on your pocketbook, you’ll love Swatch watches.